As always, the GGI lecture programme covered a wide range of topics from beginner level subjects to presentations of the latest research and technological developments. 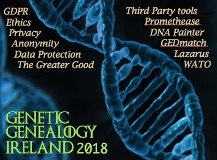 For the first time, the 2018 conference also explored ethical issues relating to the use of dna tests in public and social applications to to privacy and data protection. To view the full selection of available videos from the 2018 lectures, and those from each of the GGI conferences held over the previous five years, see the GGI YouTube channel. You'll find an extraordinary library of more than 100 lectures, with topics of appeal to researchers of all levels of experience.